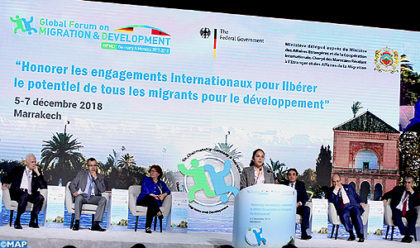 The Eleventh Global Forum on Migration and Development (GFMD) opened on Wednesday its three-day meeting in the city of Marrakech with the participation of delegates representing all UN member states and Observers. Placed under the theme: “Honoring International Commitments to Unlock the Potential of all Migrants for Development”, the forum features debates and panels on the contribution of migrants and diaspora to sustainable development, the socioeconomic inclusion of migrants and ways to ensure a safe, dignified and rights-based transit of migrants. GFMD, co-chaired by Morocco and Germany, aims at contributing to the United Nations’ Global Compact on Migration. The Compact is intended to constitute a strong signal of the international community for an enhanced global migration policy. Morocco has become a country of destination rather than a transit country for refugees and migrants. The North African Kingdom launched regularization plans for migrants and refugees, who wish to settle in the country. Morocco has revised its national immigration and asylum strategy to make it in line with the country’s human rights commitment, guaranteeing migrants’ access to basic services including, education, social housing, and employment. Marrakech will next week host the intergovernmental conference on international migration. The conference, due Dec.10-11, is expected to adopt the Global Compact for Safe, Orderly and Regular Migration. The global compact will be the first, inter-governmentally negotiated agreement, prepared under the auspices of the United Nations, to cover all dimensions of international migration in a holistic and comprehensive manner. Besides, the latest data from UN migration agency IOM, shows that so far this year 3,323 people have died or gone missing on migratory routes across the globe, the majority in the Mediterranean Sea, where thousands continue to attempt the crossing to mainland Europe, mainly from Africa and Asia.